As one of the West Coast’s leading scrap metal demolition contractors, we recycle thousands of tons of metal each year. We also maintain specialized equipment for reusing concrete on job sites in Montana, Arizona and Colorado, among other western states. For example, our concrete crusher can chew up the concrete from our demolition sites, breaking it into gravel for use as fill, among other purposes. Clients are often surprised at just how much we can recycle from each demolition project. To encourage more demolition contractors to recycle as much as possible, we’re providing the following tips. Yes, you can recycle PVC. Nineteen billion pounds of PVC products are produced every year in North America. Like all thermoplastics, PVC becomes pliable with heat; this means it can be melted down post-use and remolded into new products. Unfortunately, more than two billion pounds of end-of-life vinyl products are thrown into landfills every year. Why aren’t we as a society doing a better job of recycling this eminently reusable material? Well, there are a couple of challenges. First: contamination. 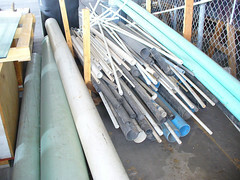 When other substances like UV stabilizers are mixed into PVC, it is harder to process for recycling. Nails, flashing and other attached construction materials must also be removed. A second major challenge is finding a recycling outfit that will accept PVC. A helpful tool for this task is the directory of vinyl recyclers at vinylinfo.org. There you can search for PVC recyclers by state. Asphalt roofing shingles can also be recycled. Because asphalt roofing shingles contain lucrative petroleum, there is a financial incentive for recycling. Experts estimate that about a third of asphalt roofing shingles removed today are recycled. Yesterday’s roofing shingles may be tomorrow’s pothole filler. Asphalt roofing shingles may also be used to create new shingles, or as a fuel supplement. However, recycling availability for asphalt shingles is inconsistent, and varies widely state by state. Arizona and Montana, two of the states where we provide demolition, do not have a single shingle recycler within their borders, yet Colorado (another one of our operation locations) boasts half a dozen shingle recyclers. To see how shingle recycling is done, check out this video profiling a Connecticut company that turns shingles into road filler. Recycling gypsum. Gypsum drywall makes up 26 percent of new home construction waste – the material must be cut to size, and many contractors simply toss the perfectly good gypsum rather than take the time to find where it may be recycled. And it does take some time. Some states, such as Massachusetts, have actively built an infrastructure for gypsum recycling – the Bay State recycles 80,000 tons of drywall waste annually. But other states have only a handful of recyclers (New York has 1; Texas 5), and others (Maine, Vermont) have none at all. However, given that recycling gypsum can cut a project’s disposal costs by up to 75 percent, we’re predicting more drywall recycling firms in the future. Many other materials may be recycled from a demolition project, including steel, concrete and bricks. If you are managing a West Coast project, and on the hunt for an environmentally conscious deconstruction firm, we would be honored to partner with you on recycling as much as possible from your project. This entry was posted in Green Demolition, Industrial Demolition, Scrap Metal Demolition, Scrap Metal Recycling and tagged industrial demolition contractors, scrap metal demolition. Bookmark the permalink.